my friend Larry Halff im-ed me and asked if I had time to work on the OAuth Summit t-shirt design. 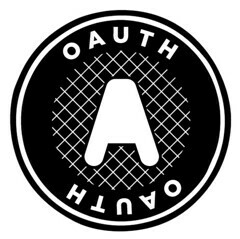 OAuth is “An open protocol to allow secure API authentication in a simple and standard method from desktop and web applications.” For those of you still wondering what that means, basically an API that acts as a valet key, so that API doesn’t give full access but partial access. Larry handed off my contact to Eran Hammer-Lahav and we started working on a concept for the OAuth summit that was held last week was hosted by Yahoo! Chris Messina designed the logo. The t-shirt was based on the LOL Cats that we’ve all fallen in love with. 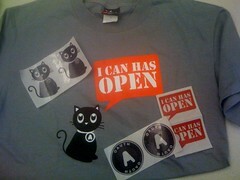 So I created a cute illustration of a cat with the talk bubble of “I can has open.” I was limited on time but it worked! :) How could you deny a kitty cat access? :) Incorporating Chris’ logo was a bit tricky. The logo had a lot more detail than allowed on a screen printed tshirt. Since it wasn’t possible I simplified the logo down to the A in a circle. I used that “token” for the collar of the cat. They handed out stickers and such at the event too. Great work Cindy! I realize the logo is pretty complicated, but I think you did a great job simplifying it. Nice work! Thanks Cindy! I had no idea you designed the shirts; I love mine. Hot shirt! Any chance these will ever be on sale online somewhere?